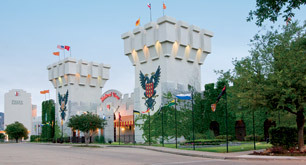 My family and I have been to Medieval Times Dinner & Tournament in Dallas a few times! Its a must see experience! Experience The Excitement of Medieval Times this Summer Break. A Four-course feast awaits as you watch the pageantry and thrills of an authentic medieval tournament come to life inside the walls of the King’s 11th Century Style Castle. 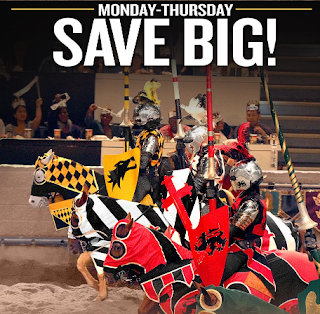 Six armor-clad Knights of the realm compete in thrilling games on horseback as the pageant unfolds and cheers of the King’s noble guests fill the arena. Skill and strength are measured in the combat. Discover which of the Knights shall become champion. There is not a better time to visit the Castle then when there is a great deal on tickets!! At this time there are not 1 but 2 GREAT deals!! 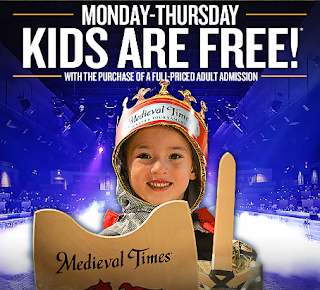 Offer 1: KIDS FREE with purchase of Adult Admission! Thanks for stopping by Dnbusters Place! This post may contain a sponsored, affiliate, or a referral link. These links help keep this blog up and running! Thank you for supporting my blog! disclosure~ this is a sponsored post, in exchange for posting these great deals my family and I will receive 4 tickets to MT in Dallas.